Collective support of our families, faculty, staff and friends has enriched the Foundation over the years. With the beginning of a new academic year, each member of the community has a fresh opportunity to make this year even better for our outstanding students than the year before. When you give to the Annual Fund, your tax deductible gift provides financial support for over 5400 students in all 8 of our schools. 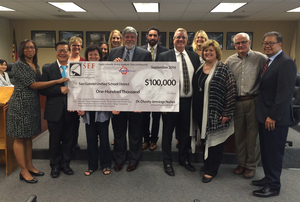 On Tuesday, September 13, the SEF Board of Trustees was honored to present the San Gabriel Unified School District with a "large check" in the amount of $100,000. These funds will be used in the 2016/2017 academic year to provide vital support for grades 1-3 visual art instruction; district wide music assemblies; field trips; teacher grants; GHS after school library hours; GHS college counseling "Naviance" program, GHS Speech and Debate support and more. We thank the many individuals who have already made their annual gift to SEF. We are off to a great start because of your investment. Your gift, no matter the size, makes you a vital part of the extraordinary outcomes our students will achieve. You may donate online using the link below or mail in your donation payable to "SEF" 408 Junipero Serra Drive, San Gabriel, CA. 91776. I hope you will join us in making an instant impact on SEF today. Our trustees are proud of the progress they continue to make and are looking forward to another exciting school year. The potential of our students is unprecedented. The engagement and enthusiasm demonstrated by our community has never been stronger. We sincerely thank you for supporting SEF!